Testimonials - Welcome to Puzzle Pieces! I dreamed big. I wanted two kids, a big career, a nice house.....That's what I thought I wanted. When Alex was born, he was 6 weeks premature but he showed us early on that he was a fighter. He came home from the hospital on time and grew and developed with leaps and bounds. Our baby boy was a dream come true. At 12 months, our little man was saying big words that a child his age shouldn't be able to say.....then it faded. My sweet and cheerful little man became withdrawn, sullen, and could not talk any more. Not hardly a word. More like grunts and pointing. What had happened to my perfect child? I have come to realize my child is perfect. He is perfectly Alex. Since his diagnosis at 2 years and 8 months of age, we have pushed Alex into ever program and therapy that we believed would help him achieve success and independence. I will never forget the day I meet Amanda Owen. She was at the first Annual Special Needs Fair held at Lewis Lane Baptist church. Alex was and still is a member of Buddy Ball so we were invited to attend. I saw her information booth and started talking with her. She told me that her spots were almost full. I sat the kids down and filled out an application right then and there. I could see the determination in her eyes that these children and adults with developmental disabilities be given a place to feel comfortable, build self esteem, and implement social and life skills. We participated in the first Puzzle Pieces walk and there was talk about the center opening the following September. It seemed to be good to be true. This great of a center in Owensboro? But it happened! Alex has shown not only improvement in social areas but also in behavior since being at Puzzle Pieces. 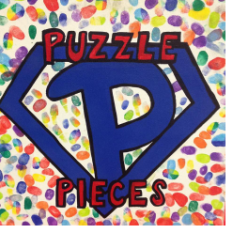 He thrives in the environment and tells his teachers each day at the last bell at school, "I am going to Puzzle Pieces!" He has met and actually calls one little boy his friend which is a huge step for my child who does not socialize with children his own age.